The BEST hotel in Bangkok for first-time visitors! After working for one week in Bangkok, I got to finally relax, enjoy the city and recharge before heading back home to Luxembourg. When choosing a hotel during holidays, I always go for the best location for my needs – close to public transport, shops, and in a lively area. This was my second time staying in Sukhumvit. Even if Sukhumvit is low on sightseeing, it’s full of shops and restaurants, and it’s lively during night time as it is during night time. The Radisson Blu Plaza hotel is within 5 minutes walking distance from the BTS station and a bus stop, that can take you to any sights you need to see in the Old City. Connected to the BTS station is also Terminal 21, a shopping centre that has everything you are looking for, so you will not miss anything. Having a room in a Sukhumvit hotel will almost always guarantee you a stunning view! This is exactly what we had – waking up and going to sleep to a view of Bangkok is pure magic. I love when hotel rooms have different spaces in them – beds as sleeping area, the desk as working area, and a comfortable couch by the window for relaxing and day dreaming. When it comes to the bathroom, it was just stunning. I was particularly a fan of the huge mirror. Even if I wasn’t a fan of the glass wall separating the bathroom from the bedroom, this was the only way you could get a city view while soaking up in the bath. The rooftop bar was a pleasant surprise! What’s a visit to Bangkok without checking out a rooftop bar? And we had one in our hotel! I would usually prefer to go at night not only because of the amazing view over Bangkok at night, but also because of the fresher weather. But I have to say that even during the day the view is stunning and the breeze will keep you cool. The pool area was smaller than I was expecting, but it offered a great city view and felt like an oasis in the middle of the urban jungle. And can we talk about the lobby and the bar? Both products of exquisite design! You know how I love food and eating, so I was absolutely blown away by their Super Breakfast! So much so that I will be writing a dedicated post just on it. 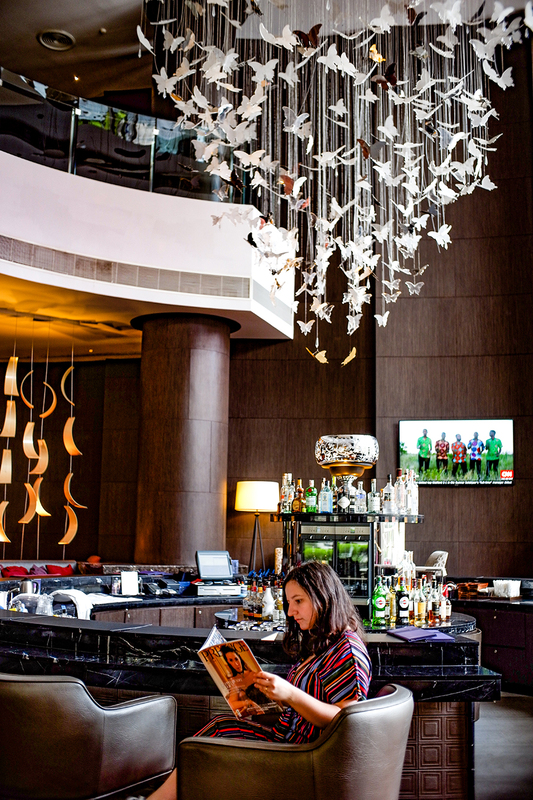 If you’re heading to Bangkok and are looking for the perfect mix of location, classy design, views and the best breakfast in town, then Radisson Blu Plaza Bangkok is what you are looking for. PLEASE NOTE: I received a media rate at Radisson Blu Plaza Bangkok, but rest assured that all opinions are honest and my own. This looks like a wonderful place to stay. It is such a sophisticated hotel. This hotel looks like a beautiful place to stay while in Bangkok. I would love to visit this city and other foreign places again someday. Thank you for sharing!